Loquats. Some might ask, “What is a loquat?” Before moving into our current house, I would have asked the same. Loquats are small orange/yellow fruit. 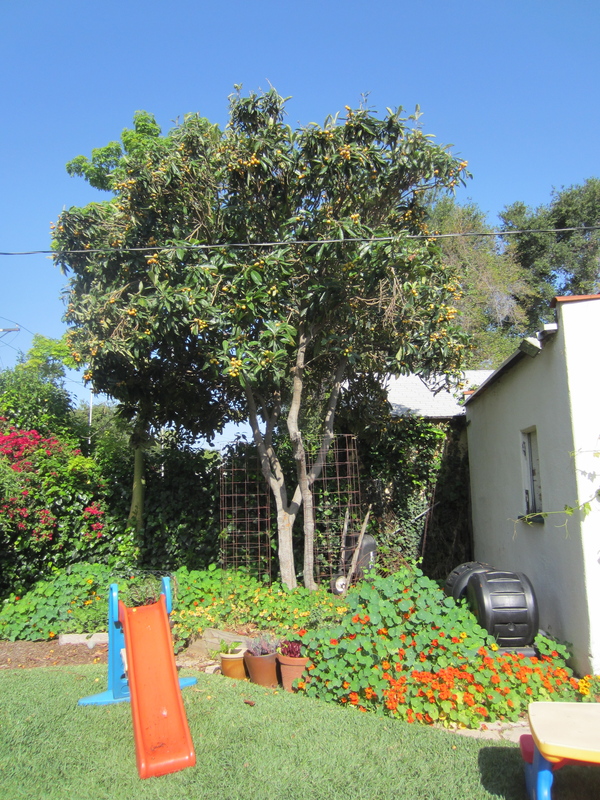 The house came with a few fruit trees: pineapple guava, lemon, plum, nectarine, apricot, and loquat. The loquat tree is quite old, judging from its height. Unfortunately, over the course of its life, it was not trimmed as a fruit tree. Our tree towers over the roof of the garage. I can reach the lowest hanging fruit with my fruit picker fully extended. Even the lowest branches sit above the top of the garage. Every spring the tree produces hundreds (if not thousands) of fruit. Every spring almost all of that fruit ends up on the ground nibbled on by squirrels, rats, all manner of birds, including parrots. Yes, I said parrots. The San Gabriel Valley and vicinity is home to flocks of wild parrots (and peacock). There are a few urban legends floating out there as to how this came to be. The parrots love the loquats and come to visit the tree at sunset. Their green feathers make them blend in almost entirely with the tree. The red spot near their beaks and their occasional squak are what give them away. Sometimes it takes a second to locate them, even when you know they are there. We did try the loquats, but find them cumbersome to eat. They have four large seeds in the middle encased in a thin, almost translucent skin. They are a lot of work for not much fruity flesh. A couple of springs ago I failed miserably at trying to make a loquat chutney. And so they get munched, then fall and rot, every spring. 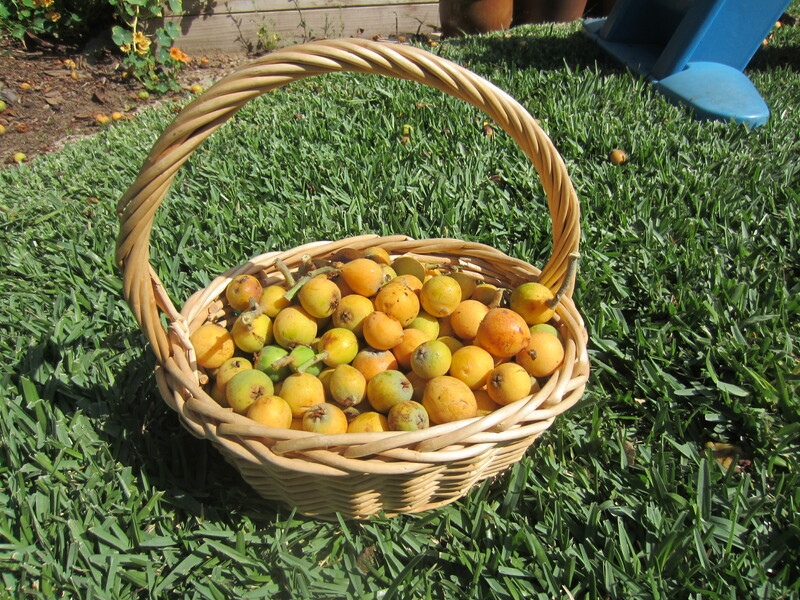 This spring I was determined to enjoy the fruit a little and make a batch of loquat jelly. I was partly inspired by a commitment I made to only give gifts this year that are either home made or locally made. 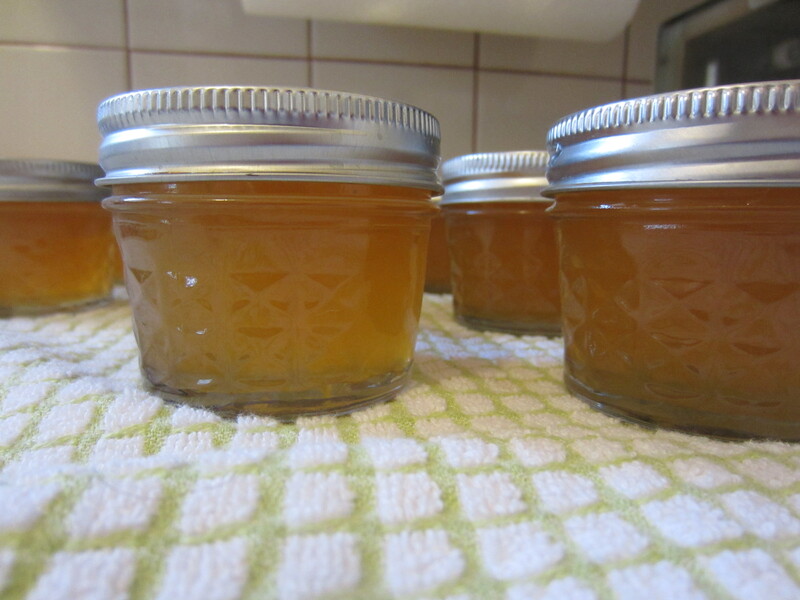 I picked, cleaned, halved, pitted, cooked, and then canned up some loquat jelly. Every single jar sealed (a first for me). So now, I have the effort behind me and eight beautiful jars of loquat syrup. Any tips for re-making jam would be very much appreciated. I’ve had that same disappointment several times. I tried reprocessing with a grape jelly once, and the consistency improved a bit. Now instead of sweet grape syrup I have softish grape jelly. I just poured all the jars out, boiled again, adding pectin again, and water bath again. Let me check my canning books. I’m not at home right now though. I had a similar issue with orange apricot jam last season. It made lovely ice cream syrup. My Ball Canning book says to give the jars 2 weeks to set. If they don’t re-process them with 8 cups at a time with 1 1/2 tsp classic pectin, 1 TBSP of water and 2 TBSP of sugar. Combine the water and pectin. Bring to a boil. Add the jelly and sugar. Bring to a boil, storing constantly. Boil hard for 30 seconds. Remove from heat. Skim if necessary. Re-jar it. Re-process it. Typos. 1. Up to 8 cups at a time. 2. Stirring not storing.